Do you suffer from dark circles or bags under your eyes that make you appear tired? The Eye Physicians of Long Beach perform cosmetic procedures to reduce the appearance of under eyelid bags and dark circles. It is important to have a complete evaluation with our oculoplastic surgeon to determine what procedure is best for your particular situation. Fillers may be used to increase the fullness and decrease the appearance of dark circles and under eye hollows. 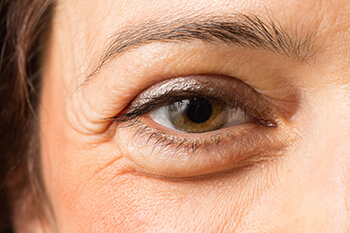 For under eye bags a cosmetic procedure called blepharoplasty may be necessary. In lower eyelid blepharoplasty, an incision can be made internally (transconjunctival) or externally through the skin. The decision regarding which approach is best for you will be determined by the amount of skin that needs be removed from the lower eyelid. The internal approach leaves no external incision line while the external incision is placed just below the eyelid margin to hide any scarring.